Ashland Bible Church is a non-denominational church located in Southern Oregon. We are a member of the IFCA International, a fellowship of churches and Christian workers committed to biblical ministry. We offer many ministries that equip, train, and encourage every member of the family in their walk with the Lord. We welcome you to visit our church and please don't hesitate to contact us with any questions. Nate has been pastor of Ashland Bible Church since 1996. He received a B.A. 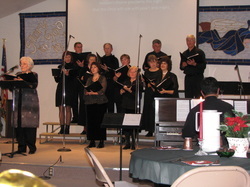 in Church Ministries from Arizona Christian University (formerly Southwestern Bible College). Prior to coming to Ashland Bible Church, he pastored Sierraville Community Church in Sierravile, CA for almost 8 years. He is married to Muriel and has four children: Nathan and his wife Whitney; Elisabeth; Kendra and her husband Brandon; and Emily. Garland served with American Sunday School Union (now InFaith) for 13 years in Southern Oregon. He then pastored in Colfax WA for 3 1/2 years followed by a 14-year pastorate in Reno, Nevada. 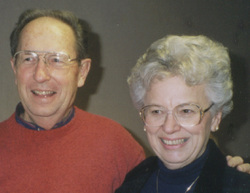 He came to Ashland Bible Church in 1989 and retired as Pastor Emeritus in 1996. He and his wife, Roberta, have four grown children.